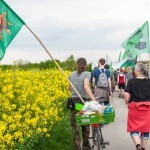 Today’s walk in the Forest has attracted over 400 people reflecting a wave of popular support sweeping not just the region but all of Germany and from around the world. 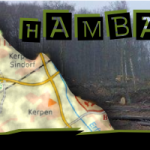 This is happening at the time when the rulling parties are no longer able or willing to hold an argument on exiting from coal and its effects on the climate but instead have become an extension of RWE special interests and are trying to redirect attention and justify large police actions to destroy the last of Hambi by talk of extremism and violence. 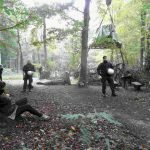 On September 19th at 8 o’clock in the morning approx 100 cops entered the millenarian Hambacher Forest [previously on S!N], occupied for last six years blocking the expansion of RWE’s open cast lignite mine, to remove the “The Tripod”, a live-in barricade. The official state line was that it was to keep the roads open for emergency vehicles in case of accident occurring in the forest. The emergency vehicles are the harvesters, bulldozers and loaders of this years cutting season which will begin on Oct. 25 and the “accident” is the global climate chaos, millions of premature deaths a year, and irreplaceable habitat loss to which Hambacher (cynically named after the forest its destroying) Mine: single largest net CO2 emitter in Europe, is not an innocent bystander to but rather a culprit extending its effect through emission and pollutants and through RWE Global Power Conglomerate machine impacting and destroying communities and ecosystem from Colombia, England and Germany to Siberia. 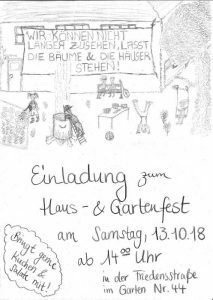 The Hambach Forest has been occupied for five years. For five years people have been building and defending tree houses in order to protect the trees they are living on. For five years diggers, cops, and secus have kept coming closer. 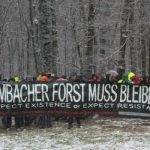 Officially, the forest is owned by RWE, a multinational energy company that does not only want to kill the thousands-of-years-old forest, destroy habitats, dispossess and displace residents from the surrounding villages to generate power. With it’s production of lignite in the Rhineland along it is responsible for 30% of Germany’s CO2 emissions. A company that does not shy away from exploiting the entire world in order to maximise its profits. It is a company that significantly contributes to generating situations forcing people to leave their countries of origin. Because the people who first have to deal with the consequences of global warming are not those profiting from coal, but people from the global South. This makes our struggle part of the struggle against imperialism, against oppression and racism. What happens here does not happen by accident. It is a symbol of the capitalist system. And we are working on means of attacking it. 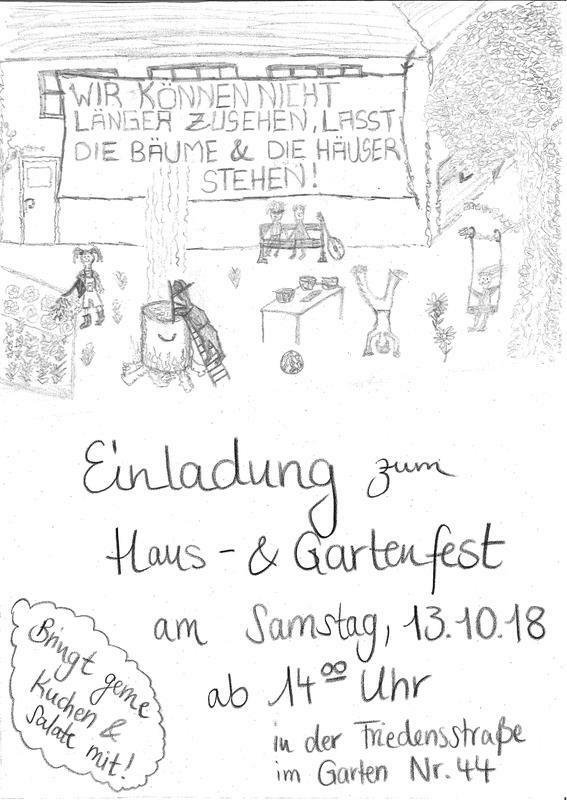 With the arrest of two other Hambach Forest activists, the repression wave against the anti­brown­coal movement has reached a new height. Only days after our comrade Jus was released from prison, after spending nearly three months locked up, another comrade has been kidnapped by the police. On Wednesday 7th October, a person blockaded one of the conveyor belts in the Hambach mine. [Previously on S!N] When this belt stops, the diggers stop moving and the trains cannot be filled with coal. This mine is the second biggest open cast mine of Europe, and the Rhineland area is the biggest CO2 emmitter in Europe. 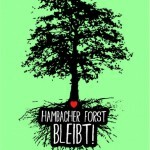 Germany: Defend the Hambach Forest! Freedom for Jus! On the 22nd of July the tower – to this date the only remaining living barricade – got evicted. The tower blocked an important access way to the Hambach Forest [previously on S!N]and its occupation. Responding to a recent call out, Grow Heathrow sent wishes of solidarity to Hambacher Forest on Thursday. 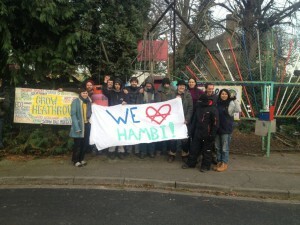 Hambacher Forest is a camp comprising four occupations in the Rhineland of Germany, which is protesting against the expansion of one of the largest opencast brown coal mines. The mine is a disaster, not only in terms of the impact on the climate from this dirty fossil fuel, but also for the local residents of the nearby villages that would be destroyed to make way for the mine’s expansion. In addition the natural ecosystem would be totally devastated. Since April 2012, activists in Germany have occupied the Hambach forest to prevent the expansion of Europe’s largest open-cast coal mine. 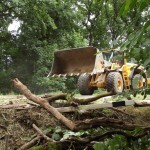 The mine expansion project would mean the clearcutting of the forest and the eviction of thousands of local residents. On March 27, 2014, the forest occupation was evicted by police and today, on April 26, 2014 a new occupation arose. There are platforms and walkways up in the trees and a big demonstration is taking place close by. After a couple of days of strong repressions and the constant attempt by the „authorities“ to criminalize the sruggle the reoccupation is successful. 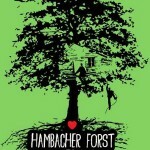 For more information and a current ticker visit our English blog (hambachforest.blogsport.de).